Although the Satellite L has its merits, namely its pretty chassis and Cortana functionality, there are better low-cost alternatives on the market. Toshiba's 15.6-inch Satellite L ($529.99, about £259, AU$640), which is intended for students, is designed to compete in a vast market. Excellent laptops, like the affordable Acer Chromebook 15 C910 ($499.99, £249, AU$620) or the sleek, luxurious and expensive 13-inch MacBook Air ($999, £249, AU$620) for example are both capable of providing high schoolers and collegians with enjoyable experiences that are suitable on the go. Obviously, student laptops come in all shapes and sizes, with different feature sets and performance specs. So, stacking the Satellite L up against a ChromeBook and a MacBook isn't an apples-to-apples comparison. However, most students don't care how manufacturers classify their laptops. They just want something that can get the job done, and Acer and Apple have set this particular standard. Unfortunately, Toshiba's newest L-Series model isn't quite on par with what we would classify as a laptop that is ideal for student use, but it does have a few nice features that should warrant at least some of your attention. Built with a textured plastic chassis that's silver-colored with hints of satin gold, the Satellite L is definitely pleasing to the eye. The chassis, which won't show fingerprints or collect dust, is glossy and smooth, and will likely avoid the heavy scrapes and bruises associated with cramped backpacks. Unfortunately, the Satellite L will weigh your backpack down and take up way too much pocket space. At 4.85 pounds (2.19kg), this behemoth is exactly the same weight and width as the Acer Chromebook, but it's .07 inches (0.2cm) thinner at 0.93 inches (2.4cm). If you're focused solely on portability, neither of these models is ideal. For reference, the diminutive 13-inch MacBook Air is only 0.68 inches thick (1.7cm) at its thickest and only 2.96 pounds (1.35kg). The Satellite L also disappoints when it comes to displaying content. With a standard HD screen that can be upgraded to full HD and touch-enabled, you're definitely not going to wow anyone with photo or video detail. Even compared to other full HD screens, the Satellite L is unimpressive. What you'll notice immediately is an obnoxious screen glare that is pervasive even when the device is in a room with no sunlight and only a little overhead lighting. Watching a movie comfortably on this device requires perfect angling. 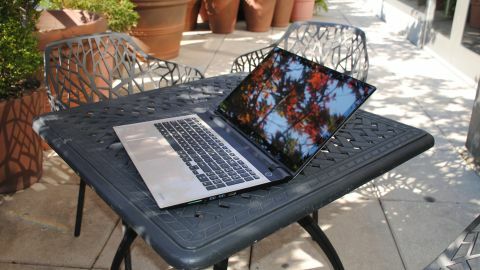 Compared to the Chromebook, which comes standard with a full HD (1,920 x 1,080 resolution) display that is a joy to experience, the Satellite L will make you want to read a book. Typing on this device is also a chore. I'm not sure whether the device I used was corrupted, or if this is an issue that will plague the entire series, but I found the buttons on the TruType keyboard to be quite sticky and unresponsive. Additionally, the off-center trackpad was inflexible, so I wasn't sure whether my scrolls and clicks registered unless I was actually staring at the screen. Math and business students will enjoy the number pad, which neither the Acer nor the MacBook features. However, if you need a backlit keyboard for pulling all-nighters, you'd better have some extra coin, as backlighting is available as an upgrade only.